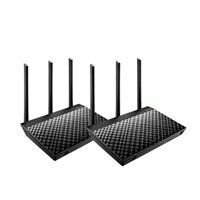 RT-AC66U B1 delivers 3x3 802.11ac Wifi with up to 1750Mbps throughput and extensive coverage. Easily setup and manage your router with ASUSWRT and the ASUS Router App. Integrated USB ports enable sharing for printers and USB storage with the ability to access files on-the-go via ASUS AiCloud 2.0. Perfect for Low Latency Gaming and 4K Streaming.